It’s the eve of garbage day. Maybe you feel a bit guilty as you roll your container to the curb. After all, despite any recycling or composting you might do, some items still must go to the landfill—and landfills have a reputation for harming the environment. But it turns out that image doesn’t always match up with the way modern landfills work. From managing gas emissions to monitoring groundwater, modern landfill science allows today’s waste collection facilities to minimize their ecological impact as much as possible. In the past, we tossed our waste into open dumps. These sites were not monitored and few steps were taken to separate waste from the surrounding environment. This meant it was easy for toxic chemicals and gases to contaminate the nearby air, soil and groundwater. These areas also acted as breeding grounds for mosquitoes and other disease-carrying pests. Many people still associate that dirty image with landfills. But today, nearly all landfills are sanitary landfills. The open dumps of the past are rare, except in cases of illegal dumping. In a sanitary landfill, waste is separated from the surrounding environment using a system of layers designed to allow waste to decompose safely. While decomposition can produce methane—a major contributor to climate change—most sanitary landfills collect this gas and use it to generate electricity, keeping it out of the atmosphere. To put it simply, sanitary landfills operate by layering waste in a large hole. The deepest spots can be up to 500 feet into the ground, like Puente Hills, where a third of Los Angeles County’s garbage is sent. As materials decompose, landfill gas experts continuously monitor groundwater to detect any leakage. Let’s dig into how each layer works to keep waste from affecting the environment as it safely decomposes. The bottom of a modern landfill is typically lined with compacted clay dense enough to prevent liquids from penetrating it. 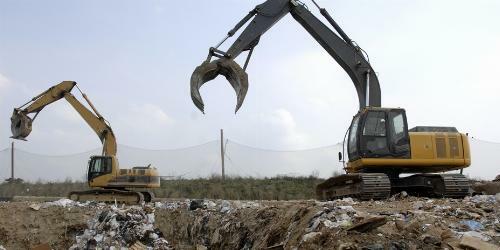 On top of the clay, landfill engineers install a liner made of high-density plastic for added protection. Some waste produces liquid as it decomposes. And as rain and snow filter through a landfill, it can carry other contaminants to the bottom. Perforated pipes are installed on top of the liner to collect these liquids—known as leachate—and funnel them to treatment facilities, either onsite or at wastewater treatment plants. Waste naturally produces methane as it decomposes and when methane is released into the atmosphere, it contributes to global warming. But methane is also the main component of natural gas. Modern landfills work to turn methane into power using gas extraction wells that pipe it to treatment areas and then to plants that will turn it into electricity or other forms of energy. In the main area of the landfill, trash is delivered and then compacted to take up less room. Every day, the new trash is covered with a layer of dirt which helps contain odors and deter pests. Once a landfill is full, it is capped with another liner made of synthetic plastic. That liner is then covered with at least 2 feet of soil and vegetation is planted. The site continues to be monitored for at least 30 years to ensure the surrounding environment is safe from contamination. Landfill capping helps to buffer humans and the environment from a landfill’s contaminants, limits migration of debris and creates an opportunity for the area to be transformed into parks and open spaces. Perhaps the biggest stride modern landfills have made toward environmental responsibility is recognizing that not all waste belongs in a landfill. Separate drop off locations for organic waste and hazardous materials provide a more eco-friendly alternative for disposal. According to Bryan Stirrat, a landfill gas expert for Tetra Tech, “There is currently considerable emphasis being placed on reducing the volume of organic waste (green and food) being disposed of in landfills.” As organic waste degrades in the landfill, it releases potent gasses and odors. On top of that, hazardous waste drop-off centers provide a safe place for the disposal of used motor oil, pesticides, paints and other hazardous household waste. Instead of pouring chemicals down drain pipes or into the garbage can to contaminate our environment, modern landfills ensure safe disposal. These technological and ecological advancements help to maintain a safer, more environmentally friendly waste system. So, Where Did Trash Go Before the Modern Landfill? Well, it wasn’t pretty. In the days before today’s landfills, trash and human waste were tossed out the window to decompose in the street. It was not until the turn of the 20th century, when urban areas began to fill up with more people (and trash), that cities started doing something about their garbage. We’ve come a long way since. Here’s how we got there. 1935 California introduced the first semblance of a modern landfill – a giant hole in the ground where trash was sporadically covered with dirt. 1959 The first guidelines for a “sanitary landfill” were introduced, advocating for trash to be compacted and covered with a layer of soil daily. 1965 The Solid Waste Disposal Act (SWDA) became the first federal legislation addressing trash and solid waste management. 1976 The Resource Conservation and Recovery Act (RCRA) began to enact standards for sanitary landfills by dividing wastes into two categories: hazardous and solid waste. 1979 The first set of standards for sanitary landfills was developed by the EPA, including criteria for new landfills and reducing disease and groundwater contamination in existing landfills. 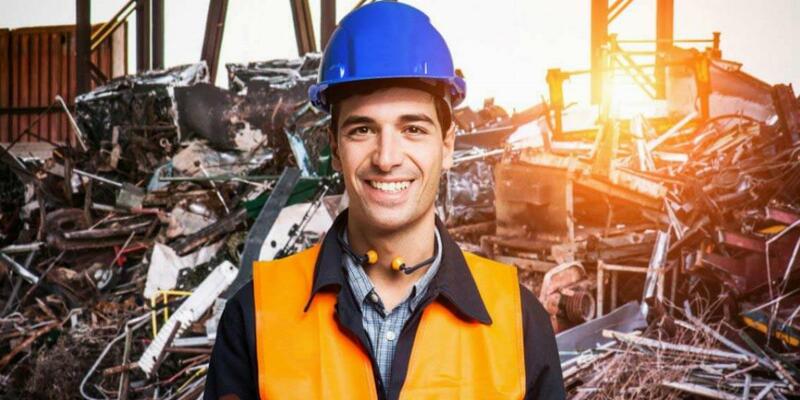 1991 Federal criteria for municipal solid waste was established by the EPA including groundwater monitoring requirements, closure and post-closure care requirements, additional design standards and corrective action for known environmental detriments. *Source: Elizabeth Ward, former chemical engineer for the U.S. EPA, author of “The Lenders Guide to Developing an Environmental Risk Management Program” and Treasurer of the Prince William Soil and Water Conservation District. Today’s landfills have progressed from a simple hole in the ground to meticulously engineered systems intended to protect human health, control groundwater contamination and reduce air emissions. While we can never eliminate all contamination risks, modern landfills work to keep our cities clean and healthy as we continue researching new ways to deal with waste. 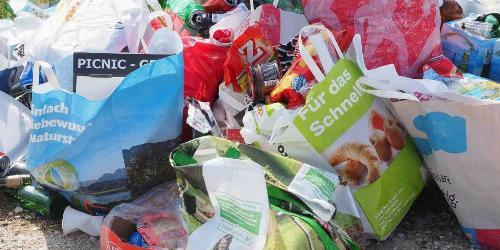 Take a look at the Sustainability section of our blog to learn how you can reduce the amount of waste you send to the landfill. It’s easy enough to find out where trash comes from but can be more difficult to figure out what happens after you leave it at the curb.